Another thing that's been in certain manufacturer flavors of Android is split-screen multitasking, though each device maker had its own interpretation of this and only a handful of apps supported it. That ends now, because Multi-window view is finally built into the core OS itself. Not only that, but it should (eventually) get along with most apps. Right now it works well enough with some, it gets pretty wonky with others, and doesn't work at all with a few stubborn ones. 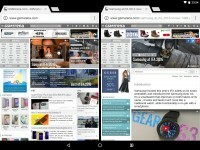 Apps that have been specially optimized by developers to work with multi-window will do just that. Then there are those that mostly sort of work, but because they haven't been optimized for the process you'll get a warning that things may go wrong. Unfortunately quite a few of these apps simply don't update when they aren't in focus, which means you essentially get one active app on one side and a glorified screenshot of the out-of-focus app. Certain things like full-screen apps (games, for example) or ones that don't support changing orientation (think of Instagram) simply refuse to enter the multi-window state. Oh, and then there's the Google app itself. 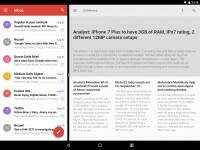 Indeed, Google's own search app doesn't want to use Google's split-screen multitasking. The good news is that you can use two Chrome windows at the same time, if you go to its menu and select the Move to other window option. 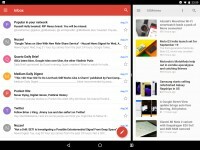 To go multi-window you long press on the multitasking button anywhere in the UI (just not from the home screen). This 'pins' the current app to one side of the screen, while the other half shows your open apps. You then choose one from there and it will take up the other half of the screen. You can drag the separator between the apps around to make one bigger than the other. Obviously this function makes more sense when it's used on tablets or maybe on phones with very big displays, but it's there to play with regardless of the device. Related is the new quick switching between the last used apps, something you should easily understand if you think about the Alt-Tab key combo on a Windows computer. Pressing that takes you to the last used app before the current one, and double-tapping the multitasking button in Nougat does the same thing. This is one of those small additions that will become second nature once you start to get the hold of it. Design-wise, the multitasking carousel overview of your open apps now shows you a smaller number of them at a time, and the app outlines are bigger. That's something you'll notice if you go into this menu a lot, but you're probably going to get used to it in a few days. Oddly, a Clear All button has showed up in the carousel, though tapping it kind of defeats the entire point of having a nice multitasking view on your device. And, unless things go awry with your Android system, clearing all apps isn't something you actually need to ever do.